In the beginning of this month, Japanese global technology company Ricoh has represented a new digital color multifunction printer (MFP) series. 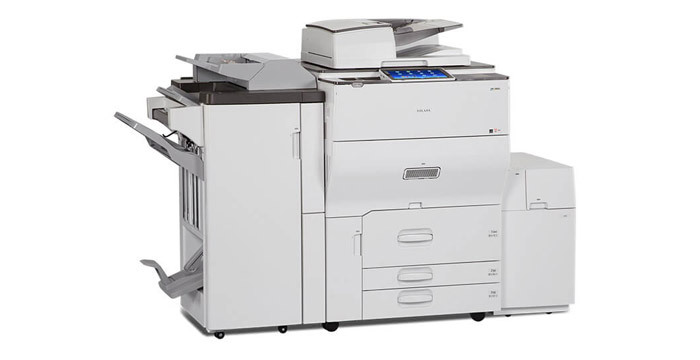 The two new models the MP C6503 and the MP C8003 are designed to enhance productivity of the high-volume environments providing super-high print speeds, multiple mobile connectivity, and excellent quality of the output together with the company’s special solutions aiming to simplify everyday document management tasks. Among them we should name the main one – Ricoh’s Workstyle Innovation Technology. It is the next step of office automation which helps to streamline the flow of information throughout the offices. The clue component of the technology is the Ricoh’s standard 10.1″ Smart Operation Panel performing exactly like a tablet or mobile device and providing a new user interface, customizable menus and one touch short cuts for quicker and smarter work. Ricoh’s Smart Device Connector app – a part of Workstyle Innovation Technology. It helps to integrate mobile devices seamlessly to provide easy sharing of information between other Ricoh devices – Interactive Whiteboards and projectors. The new devices meet all the special demands of the large-sized offices and help to manage the workflows smoothly. This entry was posted on Tuesday, December 13th, 2016 at 8:43 am	and is filed under multifunction, Ricoh. "New Level Of IoT Security With HP"
"The Fairly-Priced New Matter Mod-T 3D Printer"